I think this is the original interview. Nice video of Barr on NFLN too. I don't really get into the numbers [with contract negotiations]. It's more about feeling valued and respected than the actual dollar amount. They kind of go hand in hand I suppose, but I love being in Minnesota and I love my teammates. I want to be there long-term. I've felt I've worked really hard, improved from my first day there to where I am now. I think I'm a totally different football player. It's not really up to me. I feel like all the work I've done so far, you've got to go off that. You can't really go off what-ifs or this or that. Let the chips fall where they may. It's not my decision; it's on them, and I would like to get it. Kirk's really taking control of the offense. He's very vocal out there. He hasn't been with the guys, the receivers that long, but they seem to have great chemistry. I've seen a lot of touchdowns, so I don't know if that's something we've got to fix on defense or what's going on. (laughs) But they're doing a good job over there and I think they're going to take a little pressure off the defense. Not having to feel like we have to get a three-and-out every time, win the game for us, because we know the offense we'll have is capable of putting up points. I decided to promote this because it seems even more relevant now with Hunter's extension. I'm not good with the money stuff. Does anybody know if it's even (realistically) possible to fit both Diggs and Barr in with the cap space we have left? According to an article in the Strib by Goessling, it's possible, but some dominos have to fall into place. Productive negotiations that result in competitive — though perhaps not top-of-market — deals. Basically, Barr and Diggs need to agree to deals that are lucrative, but not the very top of their positions. Top 5 to 10, but not the very top. Young players that can contribute quickly. They need their young players like O'Neill, Holmes and Bower to develop fairly quickly so that the Vikings have quality depth without having to sign free agents. 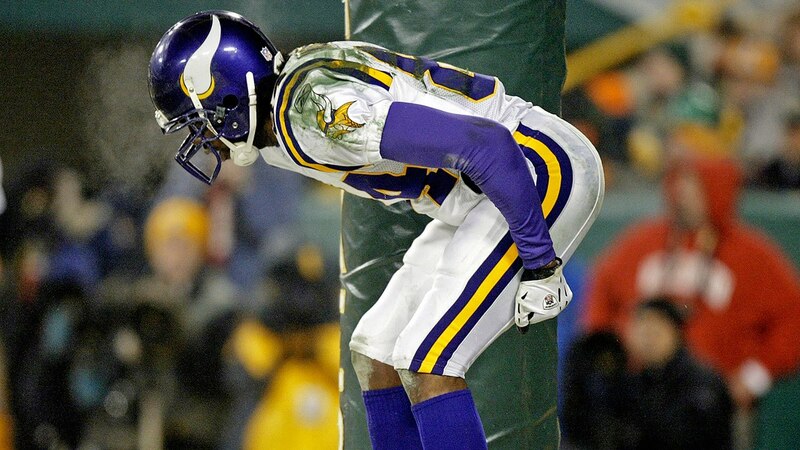 The Vikes have gone through a lot of injuries over the past few years. They can't afford catastrophic injuries to key players. Vikings have a little over 12 left after Hughes and Hunters deal. If they don't sign anyone (barring injury during the season). They can roll over and have about 28 million in cap next season. That will be enough to get both deals done unless one of those guys want top flight money. If Diggs demands 15+ a year, we can't afford both. However, 13 and 11 for Diggs and Barr respectively. Some other food for thought: The following individuals can create solid cap savings. Althogether, cutting these 4 players will give us 8 million in savings. I think Sendejo stays unless Kearse *AND* Harris have an outstanding camp. I think Easton stays unless one our backups looks great and their backups look solid. If I am the Vikings, I resign Diggs because the defense can stand to lose a LB vs the offense losing a WR. I then wait and see what Richardson looks like. If he is a world beater and simply dominant, I would take him over Barr as 7 million a year for him would be a great contract and quality Lbs can be found in free agency every year. The same can't be said about gifted 3 techs and as of now we have nothing in that mold on the roster. Sendejo also has 5.5 on next years deal, with 0 guaranteed. He's a prime candidate for restructuring or possibly being released next year. In addition to Forbath and Sherels, there are guys like Kendall Wright (600k), Tom Compton (650k), Blake Bell (705k) and Anthony Harris (705k), Tavarres King (630k), Jayron Kearse (613k), Josh Andrews (630k) but even releasing all those players will only amount to around 2 million in actual cap savings, because they'll be replaced on the roster by guys making at least the league minimum. As bubble players, outside of Compton, Andrews, Harris, Kearse, and Sherels I don't think any of them have a strong chance to make the team anyway. Its probably not logical to release any of these players for cap reasons because the savings are minimal. The expert opinion seems to be that Barr is being overpaid this season at $12MM+ due to his fifth year option. If this is the case, why would Barr extend now given that he can collect a big contract and then hit free agency? Most early extensions provide the player more now and give the team more years and a potentially better deal later. That doesn’t seem to be the case with Barr. The big pro *would* have been insurance. If he doesn't sign a contract and gets injured during the season he could lose millions of dollars. A contract provides security that for the next several years you'll be paid regardless. Considering he was late to mini-camp because he was waiting on his injury insurance to clear probably means he plans on playing the rest of the season without a contract extension. Or is at least prepared to. Thanks for the help understanding the finances, everyone! Barr would probably make more in another system (as a pass rushing 3-4) than he is worth in the Vikings' system. This might make it difficult for the two sides to reach an agreement, unless Barr really wants to stay in Minnesota. One approach they could take is to raise his already high salary this year but try to use that to get his salary down to Kendricks levels in the following couple years. Barr would be taking a team friendly deal if he agreed to something like this, but it might be the only way it works for Minnesota. I agree with others that Diggs is the greater priority, but Barr's versatility is really valuable. Sendejo will restructure. Has to. His best fit is Minnesota and going to the open market won't work in his favor...monetary or otherwise. Funny enough...I had felt Sherels was a cut candidate for years and the argument is still as compelling as ever, but there's something very comforting about a reliable punt catcher. With what this offense should be, I'm totally fine with a no fumble, reliable returner back there. And was it in 2015 or 2016 that he filled in admirably at CB? He's just a solid solid pro. Reminds me of Chris Walsh. I'd hate to see him go at this point, but they better know what they're doing and what the have if they give him his walking papers. Forbath will be gone. Unless this Carlson that they just drafted completely bombs early on, I can't see them holding onto Forbath. You don't trade up in the draft for a kicker, if he isn't going to be your guy. I'm worried about the long-term prospect of Barr, but he's better than the majority of alternatives and instead of creating a void on defense, they're best to re-sign and keep the continuity going there. I would definitely structure his deal to be top heavy though so they can cut him 3 years down the road with minimal impact. Barr pegs me as the kind of player that will do just okay after signing a deal, but once he's gone/cut, he'll dominate again on another team just to get another deal then fade into oblivion. Just conjecture, of course, but we'll see how he decides to steer the rest of his career.